With Spanish invaders, genetic mutants and trampling ponies it’s a wonder that one of Britain’s best-loved spring flowers can survive at all in the New Forest National Park. Yet native bluebells (Hyacinthoides non-scripta) are now on show in their thousands and the New Forest National Park Authority is encouraging people to get out and about to see their spectacular display before it disappears. Bryan Wilson, the National Park’s Senior Tree Officer, explained that native bluebells are common throughout the New Forest and most of the UK, but are rarely found in Europe and do not grow naturally anywhere else in the world. 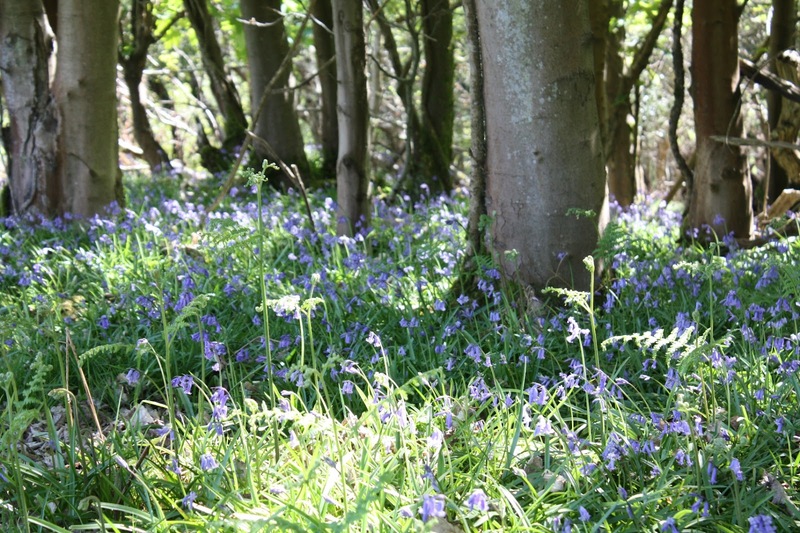 ‘They thrive in woodlands and are an indicator of ancient woodlands so if you see bluebells you are looking at land which has been relatively unchanged for centuries,’ Bryan said. Native bluebells can cross-breed with a Spanish variety (H. hispanica) which has been imported over the years by gardeners. The native bluebell flowers are a deeper blue, have a strong scent and have more droopy flower heads than the Spanish or hybrid varieties, but the differences can be difficult to spot. You might also occasionally see white flowers which are the result of a genetic mutation. However, carpets of bluebells are not particularly common in the New Forest because the commoners’ free-roaming ponies and cattle as well as deer can often trample them so you need to know where to look. Bryan said: ‘Bluebells can grow quickly in the spring because they store energy in the bulb but if they are trampled by livestock they are less able to take in enough nutrients to keep going through autumn and winter. Bluebell flowering times can be used as a powerful evidence of climate change, which is why the Natural History Museum has been asking people to take part in a survey over several years to build a nationwide picture of when both native and non-native species start flowering each year. You can help ensure a healthy future for the native bluebell, by joining the Natural History Museum’s bluebell search (www.nhm.ac.uk/nature-online/british-natural-history/survey-bluebells). However, if you can’t get out in the New Forest, you can enjoy photos of bluebells from the comfort of your armchair by visiting the National Park’s bluebell photo gallery on its website: www.newforestnpa.gov.uk/looking-after/landscape/woodland-and-trees/bluebell. Broomy Inclosure, north of Linwood. Pondhead Inclosure, near Lyndhurst - a well-fenced area which is protected from roaming stock and wild deer. Roydon Woods near Brockenhurst - owned by Hampshire and Isle of Wight Wildlife Trust with a network of paths open to the public. Sandleheath, near Fordingbridge – primroses and bluebells line the public footpaths and bridleways. Exbury Gardens and Summer Lane (the two-mile approach to the Gardens entrance from Hill Top).